Chelsea coach Carlo Ancelotti says he will not make any more new signings - and insists Deco and Ricardo Carvalho will not be sold to Inter Milan. Former Chelsea coach Jose Mourinho wants both midfielder Deco and defender Carvalho but has been frustrated in his attempts to recruit the Portuguese duo. Ancelotti said: "I don't want to take any more new players because the Chelsea squad is very competitive. "I don't want to sell Carvalho and Deco. They are both important players." Ancelotti was speaking ahead of Sunday's Community Shield clash with Premier League champions Manchester United at Wembley. 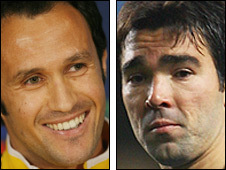 Inter Milan revealed they were hopeful of taking Chelsea pair Ricardo Carvalho and Deco to the San Siro. Mourinho wants both 31-year-olds, who played for him in Porto's Champions League triumph against Monaco in 2004, but claimed Chelsea were making it more difficult because he was involved. Deco fell from favour after arriving at Chelsea in an £8m move from Barcelona in the summer of 2008 - and recently admitted he hoped to be reunited with Mourinho in Italy. And Carvalho, a success at Stamford Bridge but restricted by injury to only 18 appearances last season, revealed recently that he wanted to leave Chelsea after four years.